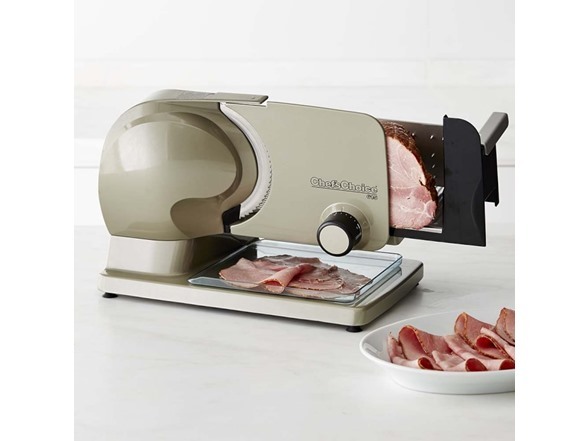 Chef's Choice's most popular food slicer offers high performance slicing at a great value. Ruggedly built of cast aluminum and stainless steel, it features a cool-running, high-torque motor for smooth, even operation and ultimate safety. 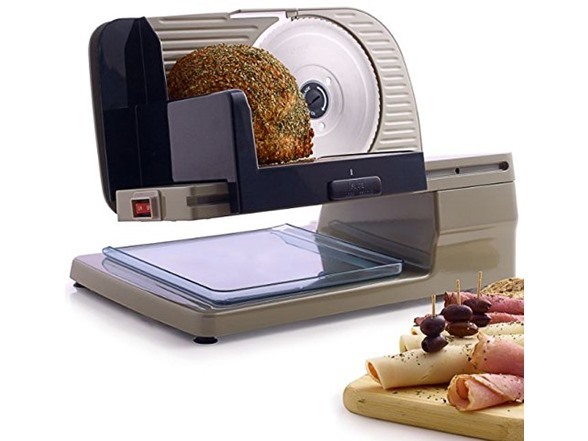 Its tilted, large-capacity food carriage promotes fast, efficient slicing of large cuts of meat like roasts, ham and turkey breast. All parts remove for easy cleaning. Built of durable cast aluminum and stainless steel. Uses powerful 120-watt cool-running, high-torque motor. Precision slice thickness control slices from deli-thin to approx. 3/4" thick. Large-capacity food carriage with spacious base for catching sliced food. "Easy-Clean" design-blade, food carriage, food pusher, food deflector and thickness guide all remove for easy cleaning. Locks when not in use for safety. 15 1/2" x 10 1/2" x 11" high.